I love to BBQ for so many reasons. Instead of being in a hot kitchen I can enjoy grilling in my cool backyard. Outside of marinating the meat, BBQing takes little planning and time. Eating at home saves money and tastes better. Since the fat melts off the meat, it’s healthier. Grilling’s not just for the main course, you can also grill appetizers, side dishes and dessert. 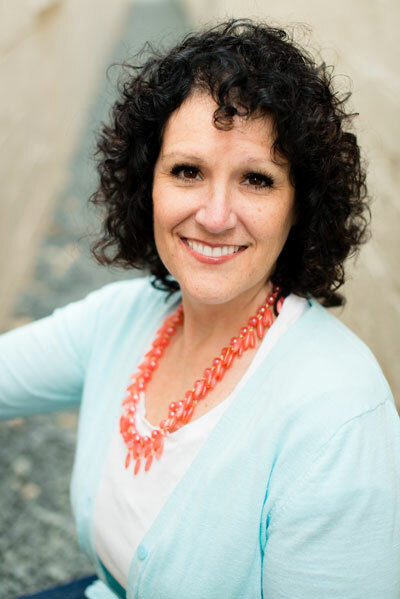 The best part…..I usually use fewer pots and pans, which makes cleaning up faster. That only leaves one thing….cleaning the BBQ grills. I usually brush the grills clean right after cooking the meat. But every so often I forget and the next time I open my grill, I will find a mess like this. 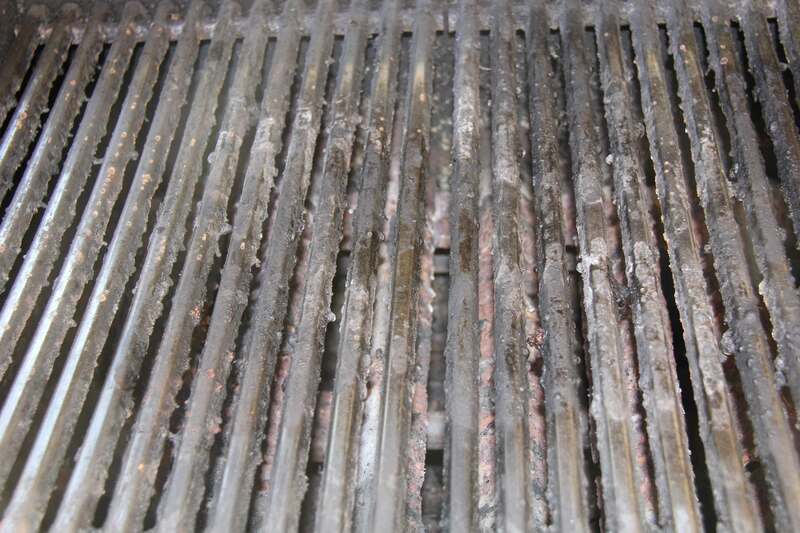 Even if I heat up the BBQ, brushing the hot grill won’t get all the left over gunk off. A couple of times a year I like to give them a good deep clean with as little effort as possible on my part. Hello, household ammonia! 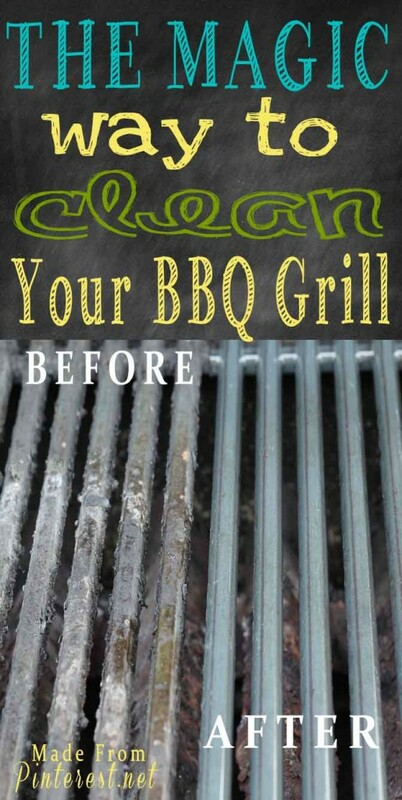 Here is how I get my BBQ grills sparkling clean with minimal effort. Ammonia is the “magic” ingredient that makes cleaning easier. 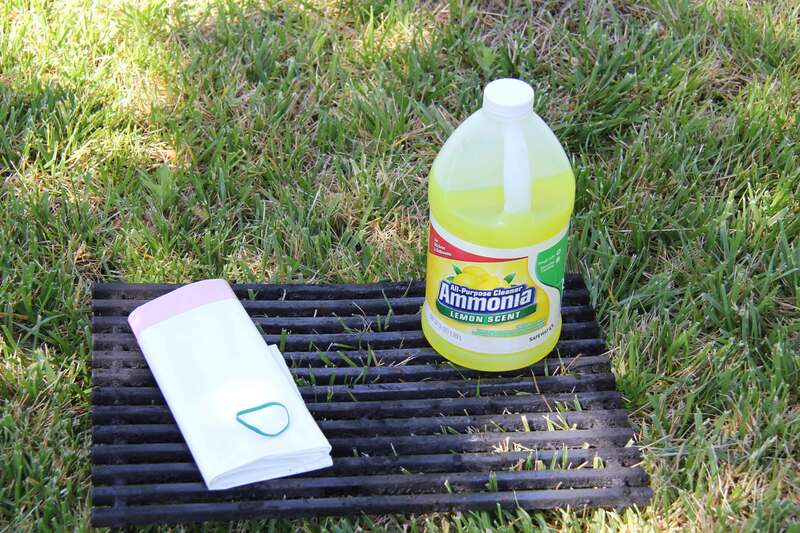 Pour 1 cup ammonia in a thick garbage bag, place your BBQ grates inside the bag and seal tightly. I used a rubber band to seal my garbage bag. It is important you seal the bag tightly. 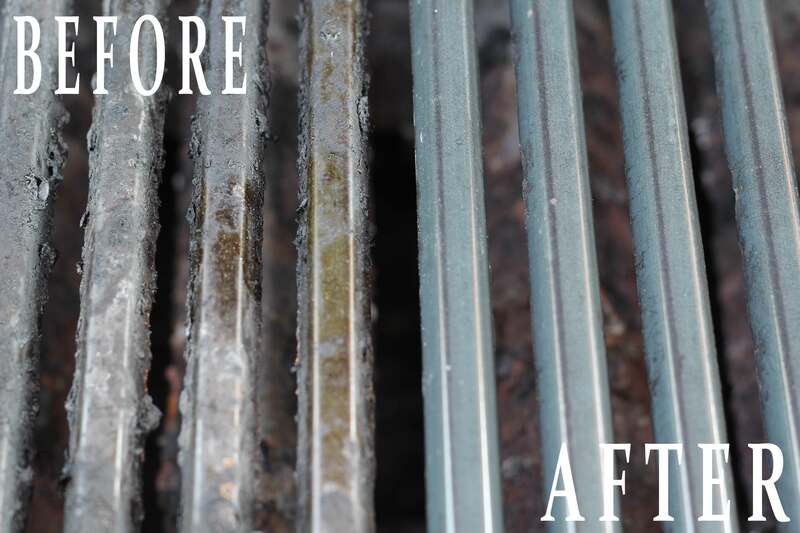 It is the fumes from the ammonia that loosens all the gunk on your grates. 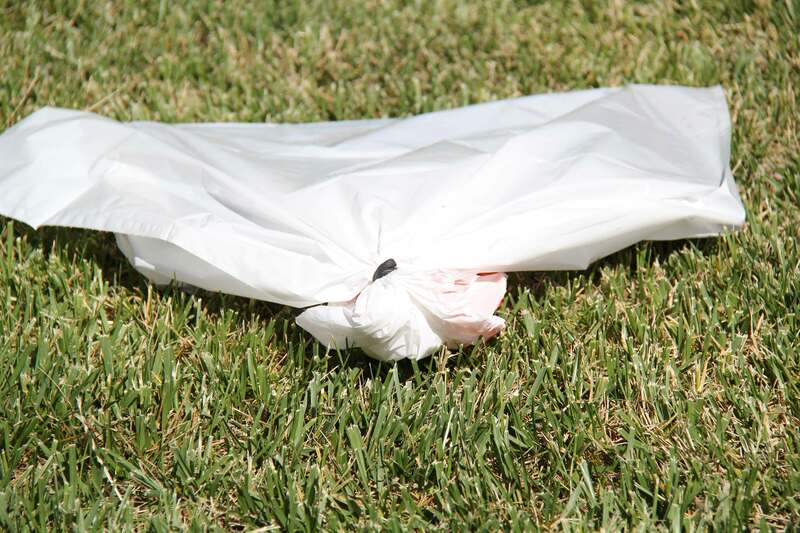 If you do not seal your garbage bag tightly the fumes will escape and your grill will be difficult to clean. It was a very sunny day today and I had a hard time getting a good picture with my white trash bag on the concrete. So I set my bag on the grass to get a good clear picture. Because ammonia is a toxic substance to animals, grass and plants I made sure the bag was sealed tight enough that no ammonia would leak out and cause any harm to the surrounding environment. 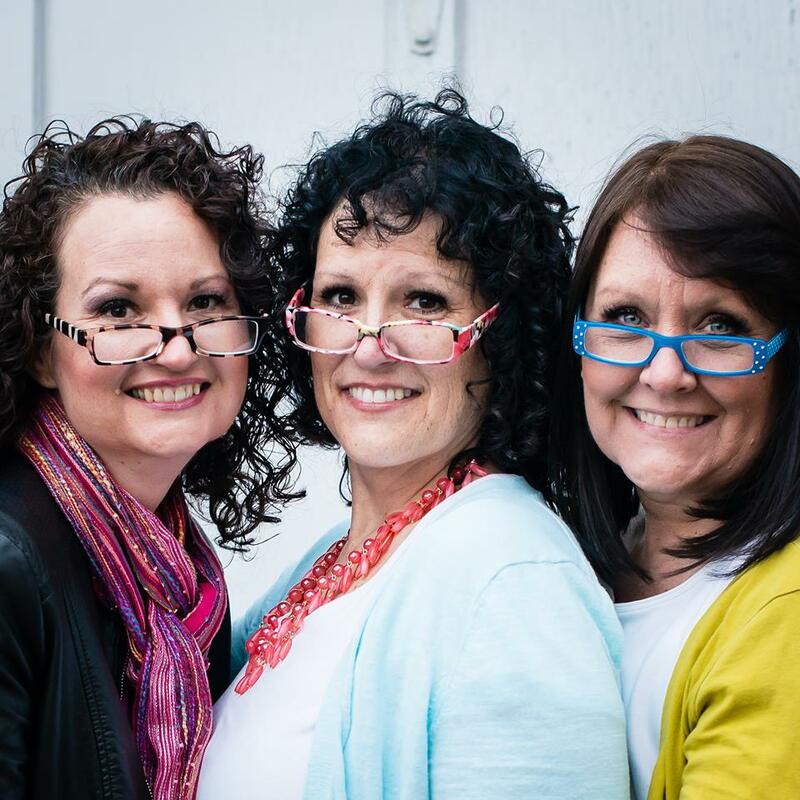 Be careful to turn your face away when you open your garbage bag the next day. The fumes will be strong and can make your eyes burn. Remove your grills from the bag, scrub them lightly if needed and rinse them off until the clean. For proper disposal of ammonia, the Poison Control Center recommends disposing of your ammonia down a sink where there is plenty of ventilation such as a garage sink. If you do not have a garage sink, Poison Control recommends opening a window(s) near the sink you are using for 10 to 15 minutes. There is only one thing you should do once your BBQ is sparkling clean…..get grilling! Here is our top BBQ recipes to help get you started. Thank you Life 123 for inspiring such a great cleaning method.